Build your bedroom around this beautiful transitional style queen headboard and footboard. The piece features design elements borrowed from mission style furniture to create a unique look. Poplar solids are finished in a rustic burnished oak to add even further style that will make your bedroom a joy to come home to. The Terrace Mission Queen Headboard and Footboard by Homelegance at Del Sol Furniture in the Phoenix, Glendale, Tempe, Scottsdale, Avondale, Peoria, Goodyear, Litchfield, Arizona area. Product availability may vary. Contact us for the most current availability on this product. 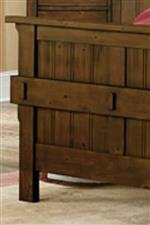 Drawer / Shelf Construction Drawers feature dovetail joinery for strength and durability. With a look inspired by craftsman style and a rustic burnished oak finish, adding pieces from this collection to your bedroom will not only be making storage easy, but also adds a beautiful look to your space. Each storage piece in this collection boasts dovetail joinery for strength and durability so the spacious drawers will stand the tests of time. Meanwhile the mission style accents bring a timeless look to the collection and will make a beautiful addition to your home. The Terrace collection is a great option if you are looking for Industrial Transitional furniture in the Phoenix, Glendale, Tempe, Scottsdale, Avondale, Peoria, Goodyear, Litchfield, Arizona area. Browse other items in the Terrace collection from Del Sol Furniture in the Phoenix, Glendale, Tempe, Scottsdale, Avondale, Peoria, Goodyear, Litchfield, Arizona area.